See also original CPR50 plan location on their website! cPanel is one of the most user friendly, and powerful control panel available for you to manage your hosting account at your convenience. You can now add email accounts, databases, backup the entire website, view bandwidth,disk space and much more all with just ONE click! There are just so many features that we can't list them all here! With a click of the mouse, you can instantly install a script without any programming knowledge. It simply means that with one click, you can have well-known tools such as Wordpress, Joomla, phpBB, OsCommerce and even personal gallery ! Create your own web hosting plans, set your own price and start selling hosting packages under your own brand name! We are invisible to your customers. Our server support Ruby on Rail and you can choose to use either PHP4.4, PHP 5.2,PHP5.3,PHP5.4,PHP5.5 or PHP5.6. This provides you cost saving and convenience. You now can host all these under ONE hosting account without additional charges! Our reseller package allows you to host and manage UNLIMITED domains under one large master account. Each account you add under your reseller plan includes a unique username, separate control panel, mysql database, email accounts and much more. You can have the choice of your own personalised nameservers like ns1.yourdomain.com and ns2.yourdomain.com. All domains will be hosted with your custom nameservers. Your visitors will not see Serverfreak DNS. Have you ever wanted to be the boss of your own hosting company, or to be able to sell your own web hosting to others but your main concern is that you have limited technical skills? Fear not! 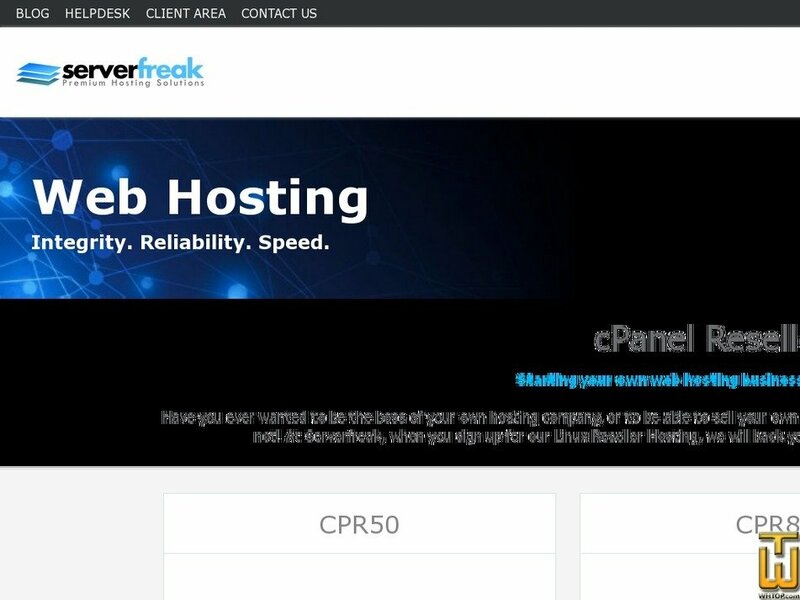 At Serverfreak, when you sign up for our Linux Reseller Hosting, we will back you up on technical support! All you do is to focus on marketing your business. Price: MYR 90.00/mo. VAT exc. Basic Reseller Web Hosting ON SALES Now! Price: MYR 140.00/mo. VAT exc. ModernOne an enterprise Web Hosting provider is happy to announce it's latest specials. Please find them listed below.